Want to have some fun with the family for Halloween?! No problem! Pick up one of Cookies United spooky and delicious cookie kits and you’ll be sure to make some great family memories. If your into cookie decorating then, the perfect kit for you is our brand new Halloween Cookie Decorating Kit, complete with 8 pre-baked cookies, ooey, gooey green icing, and lots of candy for decorating! If your more into construction and like things spooky and silly? 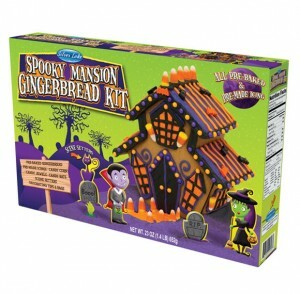 then I would suggest our family favorite, Spooky Mansion Gingerbread Kit. This kit is just as fun for adults as it is for all the boys and ghouls! Everything is included, pre-baked gingerbread pieces, pre-made colorful icings, candy corn, candy bats and candy jewels. Our Spooky Mansion also comes with fun scene setters that make it easy to dress up any creation! If you like Hello Kitty! 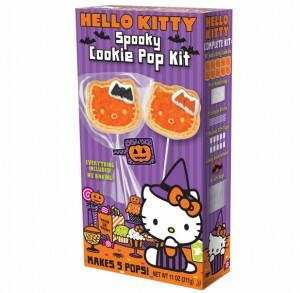 Then you are in luck…We have a deliciously good time for you and the family set up with our Hello Kitty Halloween Spooky Cookie Pop Kit. Feeling creative and want to make someone a quick Halloween gift that looks as good as it tastes, then this is the kit for you. Pre-made sugar cookies, pre-made icing, candies and bags, stick and a message label all come in this kit! You’ll be the hit any Halloween bash this year! 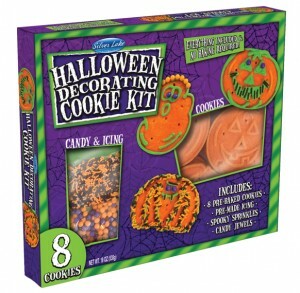 These are just a few of the fun and delicious halloween cookies and kits we offer! Try them all and have a Happy Halloween! This entry was posted in Cookies United Blog, Family Activities and tagged fun family time, halloween.